Protecting your home from water is paramount to your home’s lifespan. Investing in products that protect against the inevitable water penetration can have lasting impacts on the longevity of your home. In this week’s Basics of Building series, we’re diving into water barrier protection plans with housewrap and rainscreens. First up – Housewrap. To you it looks like we’ve wrapped your home in some fancy plastic cling wrap, but the reality is that cling wrap is your number one defense against water damage. Much like shopping in your local H-E-B, there are a slew of options for any product ranging in pricing and luxury. The same is true for Housewrap. At On Point, we believe in going to the extra mile and investing in quality product. It’s why we are proud to use Tamlyn’s Drainable Housewrap, a unique product that removes at least 100 times more bulk water from a wall over standard housewraps. Additionally, their drainable housewrap drains two times faster than other’s on the market. It’s an added bonus that Tamlyn is a Houston-based company, started right in our backyard in Bellaire, TX. Like mentioned earlier, we do everything in our power to create a strong water drainage plan so any moisture that gets caught between your façade material and the sheathing has a way to dry. It all starts with the housewrap that is applied to the exterior sheathing after framing is complete. It typically takes around 3-4 days to wrap the entire home and the wrap is installed from the bottom and works its way up. We then come back and flash the window openings sealing them off. Shortly after a home is wrapped and the window flashings are installed, we move on to installing windows and doors. The second phase of creating a solid drainage plan is the addition of a rainscreen. A rainscreen comes in a variety of shapes and styles and is used to add an additional layer of drainage between your façade material and your home. Check out this video from Construction Instruction on a rainscreen appliation. 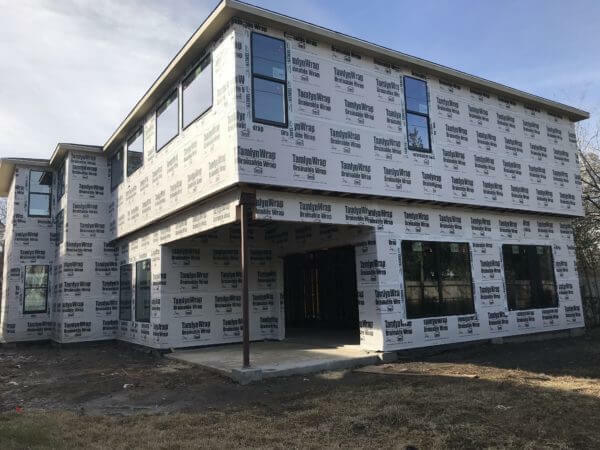 We install a rainscreen on all of our custom homes that have siding, stucco or stone in order to create airflow between the sheathing and siding material. It’s not needed for brick because the brick ledge creates a 6-inch air gap and additional weep holes provide enough ventilation on their own. Inevitably water will get through your siding material – thank you, Houston for the jungle-like humidity in the middle of the city! The rainscreen accelerates the drying process allowing for cross ventilation meaning airflow moves both vertically and horizontally to resolve the moisture. While a rainscreen adds a costly line-item up front, it’s an investment that can sustain the longevity of your home. It’s one of the ways On Point sets our self apart from other builders, as we believe in going the extra mile when it comes to building science. We can’t stress enough how important waterproofing and protecting your home against moisture is. Don’t be afraid to ask what techniques and products your builder is using to help protect your home. Our project managers are ready and waiting to explain why and how we do the things we do when building your home!